Since their debut album in 2002, Taking Back Sunday has been taking the world of punk-rock by storm. Now, nearly seven years later, the band has a new studio album, a new band roster and a new tour, all of which have proven their potential this past summer. Here, bassist Matt Rubano and I discuss the band’s current experiences, the inner workings of their fourth studio album New Again and what it takes to keep loyal fans coming back for more. What’s it been like touring with Anberlin and Envy on the Coast? What are you looking forward to most about the tour with Blink 182 and Weezer? We’re very into tour unity because being on the road as much as we are is taxing, and it’s best to love the people you are traveling with. Envy and Anberlin are great examples of this. We dubbed the tour “the best tour ever,” because we all got along so well. No egos or attitudes in any of the bands or crews. By the end of the tour, it was like forty new friends had been made. We’ve taken EOTC on tour so many times, and that speaks to our love of their music and them as people…As far as Blink and Weezer, that will be fun, not only because both of those bands influenced us when we were younger, but because we aren’t headlining and after we play we get to hang out and enjoy their shows. Watching other bands is a great way to become a better band yourself. Before the recording of New Again began, what were your initial goals as a band? Were you trying to accomplish a different sound than that of previous albums? What are some differences that you think (or hope) fans will notice between New Again and other albums? We are always trying to take steps forward in the growth and development of TBS. This record was no different in that respect. When Matt Fazzi joined, we had already done some writing, but he was the catalyst to propelling it all forward. He brought a fearless inventiveness and an open mind that really spread to everyone else and gave us the confidence to try a lot of new things. The mantra became “we will try anything on the quest for a great song.” No ideas were discouraged and that’s how you get a really great “band sound.” I’m sure fans will notice the growth and things like three-part vocal harmonies, (which we have never done,) and odd time signatures and unique song forms. Definitely. Speaking of Fazzi, can you describe what the process was like, having to find a new guitarist after the loss of Mascherino? What were some of the deciding factors in choosing Fazzi over other candidates? Interestingly, Matt was the first guy to try out, and after a few other candidates we brought him back for a final audition before deciding on him. Matt was not only the best musical candidate, but he was also the only one who didn’t seem to be wrestling with the idea of “what would TBS do here.” He was really interested in contributing his own musical voice to the equation, which was something we were really set on finding. Beyond that, and probably the winning attribute, is that Matt is a really positive and beautiful human being. He helped replace sarcasm and animosity with love and respect amongst our band members, which was something that always held us back in the past. We are better at writing and playing together now because of that, and I believe that this line-up of the band will be the most prolific. Since Tell All Your Friends, Taking Back Sunday has established an immensely devoted fan base. Although you guys have accomplished a lot, you still seem accessible to fans, which is rare for many bands on your success level. In the age of impersonal social networking (MySpace/Facebook,) what is some advice you’d give to up-and-coming bands in regards to staying connected with fans on a personal basis? When we went out on tour this past December (Fazzi’s first full tour with TBS,) we really embraced the people that came out to the shows. We spent the time before and after the set at the merch table and were always around to hang out. It was great to do that again after a tour like Projekt Revolution (Fred’s last tour with TBS,) which keeps you backstage in huge amphitheatres…We are kind of the anti-rock stars. We like to meet our fans and listeners and probably do more meet and greets and personal interaction than most bands…I think new bands need to treat people as individuals and not “friend collections” like they are on social networking sites. That stuff is helpful, but it literally doesn’t mean a thing if you never meet those people and give them something real. Your shows are the best opportunity to do that. For those new bands who fancy yourselves big-superstars that are above all of this, I wish you luck on your short, ego-driven careers. Agreed. In regards to your career thus far, who has been your favorite band to play/collaborate with? Is there any band or musician you’d wish to work with in the future? We have had the privilege of playing with so many people we admire and look up to, like Jimmy Eat World, Green Day, Rage Against The Machine and Queens of The Stone Age. As individuals, we all have different tastes, but I would love to write or work with Jack White or Josh Homme. I think they are two of the most powerful voices in rock today. Interesting! In terms of TBS’s lyrics, you guys seem to describe all of those unspoken, idiosyncratic feelings that people may not always admit to, but can definitely relate to, without ever having to mention the word “love.” Can you describe the brainstorming process of how you typically come up with these song ideas? I attribute that all to Adam, as he has always handled the lyrical part of TBS. He labors over the lyrics until he feels they are exactly as he wants them to be. On New Again, he went for a way less cryptic approach and was more honest and literal with what he was trying to convey. For fans that haven’t seen you on tour yet, what can they expect from your live shows in comparison to past tours? Will there still be suits and swinging microphones? We have always tried to make our shows like a party, with no separation between us and the audience. It’s not always easy to do in larger venues, but we try to make the show as exciting as we can. We’ve got so much music to choose from to make our set lists these days, and that makes the show diverse. We also are trying new arrangements of older songs and adding instrumental interludes. Awesome! So currently, your band has four albums under its belt. You guys have played with and alongside many diverse musicians and have performed all over the globe in shows and festivals. You’ve overcome the loss of two guitarists. You have one of the strongest and most loyal fan bases around. 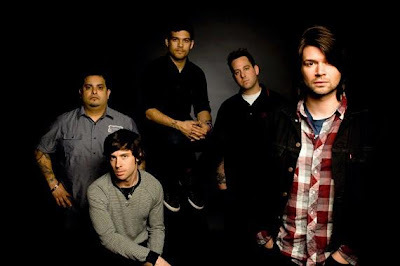 You still manage to stay real, level-headed people, no matter where success takes you…What do you have to say to anyone who thought Taking Back Sunday wouldn’t make it this far? We have always looked at ourselves as the underdogs. It takes a lot of effort and hard work to get where TBS is, and to be honest, I’m too focused on it to care what someone who doubts us thinks. This band has been counted out before, but we’re kind of like the boxer you can’t knock out. Besides that, we love what we do, and that has always been the fuel to keep us going.